Gifts are one of the most important customary in India and along with the happiness gifts give, also comes a major tension of its taxation. Often there is confusion over which gift is taxable in India. Generally, if they are received from relatives or during any special occasion specified by the Income Tax Act, no tax is levied on its receipt. Further, the Act also gives some relaxation in other cases where if gifts are received within the limit prescribed, they shall be exempt from tax. ii. As an Immovable Property Exempt upto Rs. 50000. Where some consideration has been given less than its Stamp Duty Value and the difference between them is Rs. 50000 or less, gift received shall be exempt otherwise full amount shall be taxable. iii. As a Movable Property Exempt upto Rs. 50000. Where some consideration has been given less than its Fair Market Value and the difference between them is Rs. 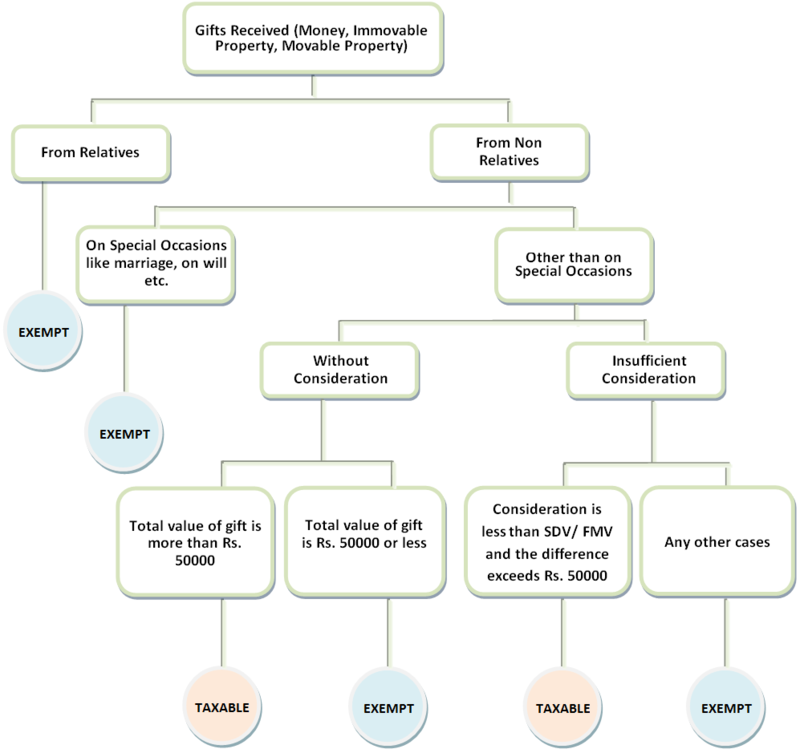 50000 or less, gift received shall be exempt otherwise full amount shall be taxable. Spouse of the persons stated above from 2 to 6. If the Gifts are received from any person whether a relative or a non-relative during the following occasions, then they are treated as Tax Free income. Gifts received on marriage of the assessee. Gifts received by way of inheritance or under a will. Gifts received from any local authority. Gifts received from any trust or institution registered under section 12AA. From any Fund or Foundation or University or other Educational Institution or Hospital or other Medical Institution or any Trust or Institution referred in the section 10(23C). Amount of Gift is below Rs. 50,000 : If a person receives any gift in form of cash or cheque and the total value of such gifts in a particular financial year is Rs. 50,000 or below, then the gifts received are treated as exempt from income tax and hence they are not taxable. Amount of Gift is above Rs. 50,000 : On the flip side, if the aggregate value of gifts received by cash or cheque exceeds Rs. 50,000, the whole amount of money received is taxable in the hands of the receiver. A receives Rs. 45,000 as a gift from one of A money received is taxable in the hands of the receitax on the same as the total money received as gift is less than Rs. 50,000. But, if A receives another Rs. 21,000 from another friend, then at the year end, A is liable to pay tax on the whole amount of Rs. 71,000 because the total money received as a gift in a year is more than Rs. 50,000. It is to be noted that the tax shall be payable on full amount i.e. Rs. 71,000 and not the amount in excess of Rs. 50,000. Immovable property, being land or building, received from a non relative on occasions other than those specified shall be taxable. However, where such gift is within the prescribed limits, it shall be exempt from tax. The stamp duty value or Circle Rate of the property is Rs. 50,000 or less : Any receipt of immovable property without consideration, which means, free of cost is not taxable if the stamp duty value of such property is Rs. 50,000 or less. The stamp duty value of the property is more than Rs. 50,000 : On the other hand, if the stamp duty value of such property exceeds Rs. 50,000, and a person receives it without any consideration then the stamp duty value of the property will be treated as the taxable income in the hands of such person. Inadequate consideration to this context means paying an amount less than the stamp duty value of an immovable property. In other words, where a person has received an immovable property by way of a transfer and has paid an amount lower than its stamp duty value in connection to this acquisition, such payment shall be deemed as an inadequate consideration. The Income tax Department considers it as a notional income that has accrued to the receiver as the receiver has been benefited in some way by paying lesser amount for a more valuable property. So, this notional income is chargeable to tax as discussed here under. If the difference between the Purchase Price and the Circle Rate of the property is Rs. 50,000 or less : The receiver of immovable property may get rid of Income Tax if the difference between Purchase Price and Circle Rate of the immovable asset is Rs. 50,000 or less. If the difference between the Purchase Price and the Circle Rate of the property exceeds Rs. 50,000 : On the contrary, if the difference between Purchase Price and Circle Rate exceeds Rs. 50,000 then the difference amount is considered as a Notional Income and therefore it is included in total income while calculating the Income Tax. Note : If a person receives more than one immovable property in a year, then the benefit of up to Rs. 50,000 shall be taken into account for each property separately. If an individual receives a land of Rs. 48,000 and a shop of Rs. 42,000 as a gift during a financial year, the individual is not liable to pay the tax on such gift because the value of each of the properties received by the individual in the previous financial year is less than Rs. 50,000. Further, for this section the stamp duty value shall be taken as on the date of registration of the property. But, if the date of agreement and the date of registration of property are different, then the date of agreement shall be taken into consideration for determining the stamp duty value. Only the above mentioned movable properties are considered for the provisions of tax on gifts. In simple words, any property, other than those specified, shall be outside the purview of income tax act when concerning on taxability of gifts. For example, If Mr. G receives any painting as a gift from his friend it will be taxable if its value exceeds the prescribed limits. Had the gift been a car, it would have been completely exempt from tax irrespective of its value. Fair Market value of the Gift is Rs. 50,000 or less : If a taxpayer, being an individual or a HUF, receives any property for no consideration, and the fair market value of which is Rs. 50,000 or less, then it shall be non-taxable. Fair Market value of the Gift is more than Rs. 50,000 : If the fair market value of a movable property exceeds Rs. 50,000 and the assessee has received it without any payments, then the fair market value is treated as the Notional Income of the tax payer and therefore, it is taxable. If the difference between Purchase price and Fair Market Value of the Movable Property is Rs. 50,000 or less : In case, the movable property has been acquired for a price less than its fair market value and the difference between the purchase price and fair market value is Rs. 50,000 or less, then no tax shall be levied on such gift. If the difference between Purchase Price and Fair Market Value of the Movable Property is more than Rs. 50,000 : A gift of movable property is taxable if the individual is in receipt of such property at a preferential price which is below its fair market value and the difference between purchase price and fair market value is more than Rs. 50,000. The calculated difference is the notional income of the person and as per income tax law the difference so calculated is fully taxable.